Every year the number of rich and the level of their wealth increases at a more rapid pace than global economic growth more broadly. Privatization in emerging markets, the technology boom along with the money that created, the growth of the financial industry and – until recently – increased commodity prices have all increased the wealth of existing billionaires, while also creating a new class of wealthy individuals in emerging markets. 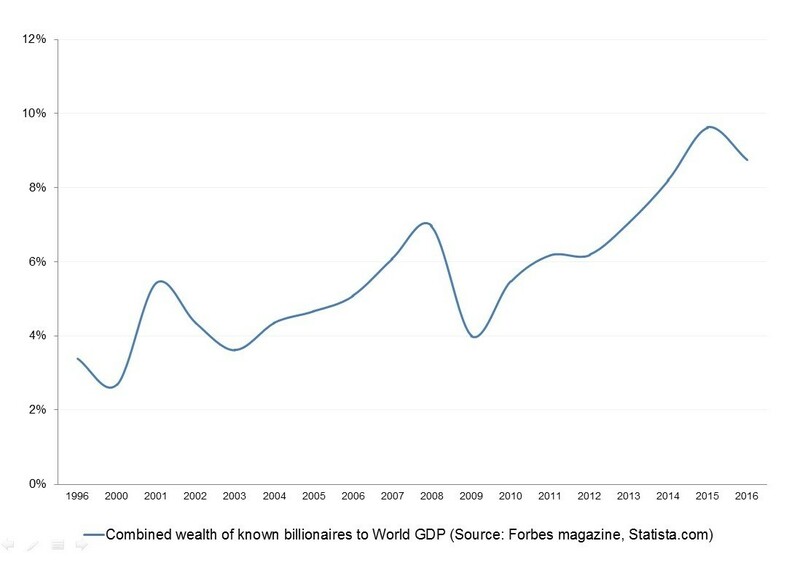 Today, private capital in the hands of billionaires represents 9% of global GDP compared to 3% 20 years ago , thus making billionaires significant players in the world economy. At first sight, this trend looks entirely negative. However, this new generation of wealthy individuals is different from those who came before them. For one thing, in the past two decade, more and more of them are now self-made billionaires. And more importantly, they seem keen to invest larger amounts of their capital in social projects than has been the case in the past. It could be argued that when wealth inequality increases, there is less room for self-made entrepreneurs, and economies will mostly consist of generational family businesses. However, our recent analysis shows that the proportion of self-made billionaires has increased in the past 20 years from one-half to two-thirds of the world’s billionaires. How do we account for such a shift? One explanation is that today, talented entrepreneurs are able to make far more money than they did in the past, when many of the spots in the lists of most wealthy individuals were reserved for heirs to large fortunes. Preliminary research suggests that, in most cases, increasing numbers of “new rich” boosts the global economy, largely thanks to the technologic advances, efficient business models and innovations that have made these people wealthy in the first place. Not only does it tend to lead to broader gains, but to many it would seem a fairer source of wealth compared to those who simply inherit their fortunes and continue to pass it on to the generations that follow. Throughout time, many wealthy families have at least tried to give something back. Take the example of the Rockefeller Foundation, which was founded by the billionaire family in 1913. A couple of decades later, the director of the foundation’s Division of Medicine and Public Health receive the Nobel Prize in Medicine, in recognition of the work he and the foundation had done in research on yellow fever. Today, more and more extremely wealthy people are accepting that because of their position of privilege, they have a duty to give back to society. Just 20 years ago, only two of the 10 richest people in the world – Warren Buffet and Bill Gates – had committed to using most of their wealth for social causes . Now, many more have taken the same step. Take the example of the Giving Pledge , where extremely rich individuals commit to give the majority of their wealth to philanthropic causes. When it was founded in 2010, 40 people joined, with combined assets worth more than $125 billion. Today, you’ll see 142 names on that list, worth a combination of $732 billion . That’s nearly 1% of global GDP and 10% of the wealth owned by billionaires. We seem to be seeing a new generation of wealthy people who are achieving success – and fortune – at a much younger age, and are deciding to use that to leave a positive and lasting impact on the world. And unlike in the past, they’re not waiting until they’re gone to start doing that. Global rates of inequality are not something to ignore. Not only is it unfair, but research suggests its bad for growth . As the Forum wrote back in 2014, figuring out how to tackle rising inequality is one of the key challenges of our time . A new generation of self-made billionaires is starting to see that they too have a role to play in dealing with this challenge.